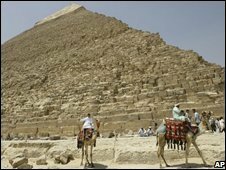 Egypt's famous Giza Pyramids are being given a £14m ($27m) makeover, starting with a state-of-the art security fence to stop hawkers harassing tourists. Visitors to the World Heritage site have for years had to fend off persistent peddlers, offering camel rides and trinkets. Now a 12-mile (20-km) fence, complete with infra-red sensors, security cameras and alarms has been erected. It is the first phase of a project to modernise the 5,000-year-old site. Egyptian authorities say once the revamp is complete, it will make visiting the Wonder of the World a friendlier experience. "It was a zoo," said Egypt's chief archaeologist, Zahi Hawass, recalling the free rein given to traders until now. "Now we are protecting both the tourists and the ancient monuments," he was quoted as saying by the Associated Press news agency. The chain-link fence with its motion sensors, which reaches a height of 13ft (4 metres) at some points, will set off alarms and alert the security control room if anyone gets too close. 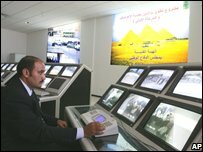 Watched by CCTV, visitors will now enter through a security building and pass through gates with metal detectors and X-ray machines. The site where the three Giza Pyramids stand - located on the outskirts of the capital, Cairo - used to be completely open and tourists faced a gauntlet of peddlers selling everything from souvenir statues to photographs. But some traders now fear they will be unable to make a living if they cannot freely approach visitors. "I've been working here for 25 years," a camel rider told AP news agency. "Now I don't know if I will be here tomorrow. I have five children, a wife. What will happen to us?"